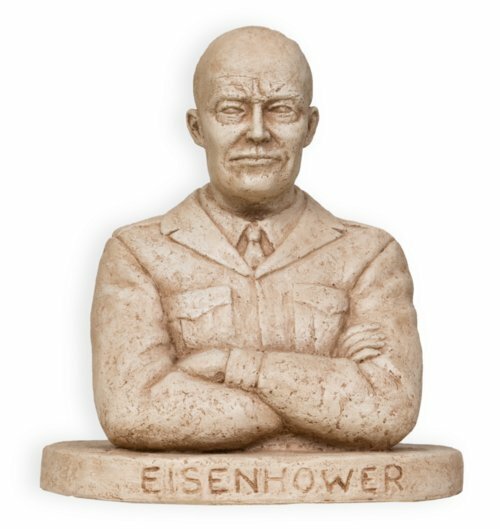 This small plaster bust by Kansas artist Peter "Fritz" Felten, Jr. depicts General Dwight Eisenhower. The model is associated with the 1981 installation of statues in the Kansas statehouse rotunda. A special committee selected Felten from Hays, Kansas, as the sculptor of statues depicting four notable Kansans--Arthur Capper, Amelia Earhart, Eisenhower, and William Allen White. Felten created this small model and three others to demonstrate his design concept. Originally from Abilene, Kansas, Dwight Eisenhower was the Supreme Allied Commander during World War II and later the 34th President of the United States. According to Felten, Eisenhower was a "decision maker" who "always stood in neat poses."